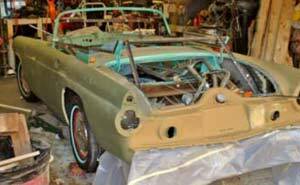 After assessing the situation we decided on a course of action that would, we hoped, get our '55 T-Bird car restoration project to the painting stage by Spring '05 (it was September '04 at the time). We needed to create the new steering column fittings to the steering rack, run new brake lines to the dual master cylinder, mount the new radiator and A/C condensor and create a new shifter for the AOD. Also, the body undergoes subtle-but-noticeable shifts in the door openings when it's bolted to the frame, so all the finish work needs to be done with it in place. If we waited to do this work until after the body was painted the probability of damaging the finish would be very high. Also, we weren't sure of how much cutting, bending or otherwise altering the metal would be necessary to accommodate the mechanical changes. What we didn't want to do was have to raise the body again to paint it. 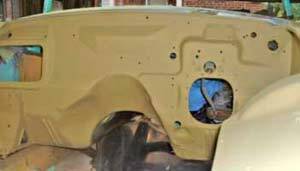 Having to do so is a big, fat nuisance, so to accomplish this goal we would have to strip the engine compartment sheet metal and prep and paint it. We could then mount the master cylinder and new cooling system/A/C components and mask them with plastic to keep sanding dust and overspray off while the body was being prepared. 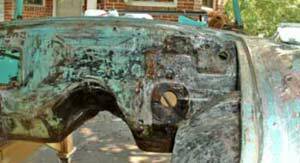 The engine compartment was coated with several layers of black paint. Fortunately, our body cart was tall enough that we could stand inside the bay and work at eye-level, so we applied chemical stripper, lined the floor with newspaper and started the removal process. 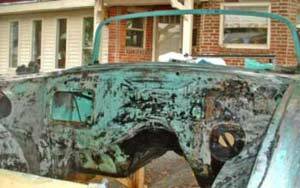 The removal of the black paint revealed the original turquoise finish. It took a whole day and 6 applications of stripper, but when we were finished the sheet metal shined brightly and no significant rust was found. 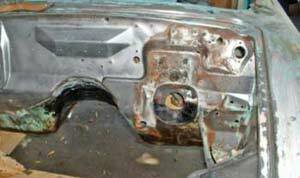 We washed the whole area in mineral spirits (to neutralize the stripper) and then wiped on a generous coat of metal prep to keep flash-rust away. The next day we sprayed a coat of etching primer on the surface and let it dry overnight. 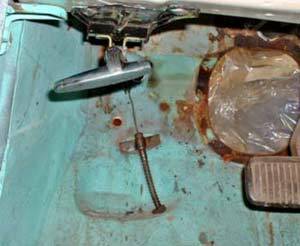 This was followed by a wipe-down with PrepSol and then with a tack rag, after which we applied two coats of catalyzed enamel in body color. Just prior to this work the decision was made to paint the car Torch Red (an original color that is now a Ford fleet color). Even though the engine bays back then were painted black, we wanted the engine bay to show a little more detail so we decided to paint it red. Nothing like a little shiny metal to give you a sense of accomplishment. Looks much better now, doesn't it? By the way, before painting we took the time to drill holes and select hardware to mount the new dual master cylinder (68-82 Corvette, for those interested in doing this conversion.) After painting we figured the best place to store the cylinder was on the firewall, so we mounted it along with the [freshly powder coated] hood release/latch bar. After a few days we took the time to mask the entire engine bay with clear plastic sheeting, taping the top edge to the flange running under the hood. We clipped the bottom edges with paper clips (for easy removal) and went on to other tasks in preparation for reinstallation of the body onto the frame. Frankly, we were a bit worried about putting the body back onto the frame. 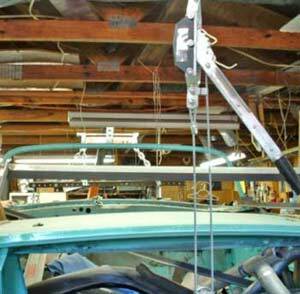 After all, the entire frame had been cut off just forward of where the firewall sits in order to install the Mustang II front suspension. Granted, we made all the appropriate measurements many times before and after the cutting and welding, but it doesn't take much for things to be off. We were concerned, therefore, that the front wheels wouldn't be in the right place in the body's wheel openings and that the front fender/body mounting plates would no longer line up with the front of the frame's mating plates. The time had come, however, for the lowering of the body and there was no turning back! The come-along is hitched up and all slack has been taken out of the cable. Notice the nice red engine bay, all protected with plastic. To perform the task we had to once again hook up the come-along to the carrying beam bolted in the rear of the trunk floor. Also, we had to connect our engine crane to the two mounting plates on the front of the firewall. Next, we raised the body a couple inches in order to get it off the rolling dolly. We left the car hanging in the air while we rolled the dolly out into the driveway and disassembled it. Then we rolled the chassis under the raised body and started lowering - very, very carefully. It's almost there, as you can see. Another 6 inches down and the body's mated back with the frame.) Much to our surprise and delight, the body slipped perfectly down onto the frame and all mounting points lined up just as they had back in 1955. We suddenly became far more confident. 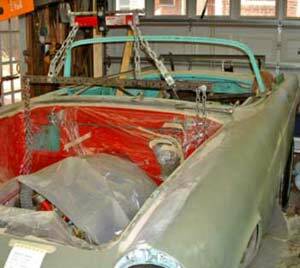 The T-Bird is back in one piece, and the plastic sheeting will protect the chassis from dirt and overspray. After mounting the body snugly we removed the supporting metal angle-iron pieces, the come-along and the engine crane. The one thing left to do was to hook up the parking brake assembly so the car could be safely moved and kept from rolling. The T-Bird is back in one piece, and the plastic sheeting will protect the chassis from dirt and overspray. The brake is in place and it works! While lowering the body we were careful to keep the parking brake's cable assembly in the proper position. Once the body was down we pushed it up through its hole in the lower firewall. We had previously cleaned up the parking brake handle assembly and painted the bracket, so we connected the cable to the rear of the handle and bolted everything into place. One pull of the handle and we were rewarded with a car that couldn't be rolled. That gave us a sense of security, if not real accomplishment.